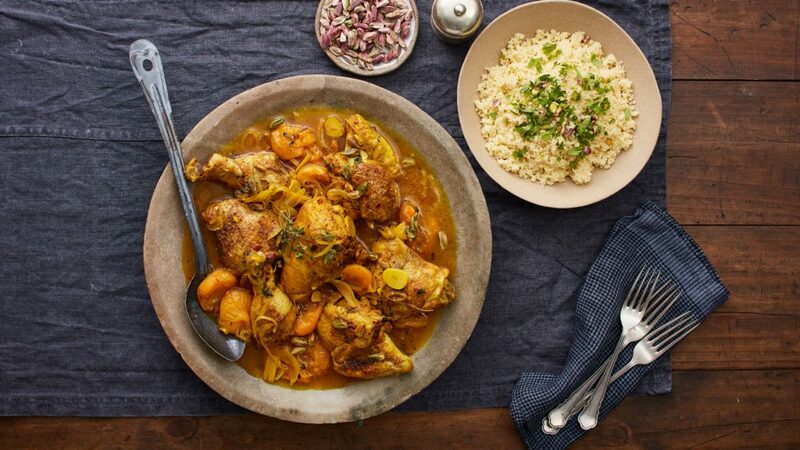 This one pot wonder is packed full of flavour, with a delicate blend of middle eastern spices. Fresh apricots, a fruit often used in Ottoman cuisine, give a balanced sweetness to this dish. Mix salt, cumin, pepper and turmeric together in a large bowl. Add chicken pieces and toss well to coat. Turn on flexInduction to 9. Heat olive oil in a large heavy-based pan over front section of induction. Add chicken pieces and brown for 5 minutes or until golden brown. Remove and set aside. Move pan to middle section of induction. Add onion, ginger, garlic and any remaining spice mix to the pan and cook for 3 minutes or until softened. Add saffron threads, thyme and wine. Move pan to front section of induction. Bring to a simmer; add stock, chicken pieces, apricot halves, lemon juice, zest and honey. Pour over enough water to cover chicken and bring to the boil. Move pan to back section of induction; cover with a lid and simmer for 10 minutes. Uncover and simmer for a further 10–15 minutes or until the chicken is tender and cooked through and the sauce is slightly reduced. Stir through the pistachio nuts and serve with couscous.